With a theme of 'Wisdom of the Moon' the newest offering from The Witches' Almanac is just plain wonderful. 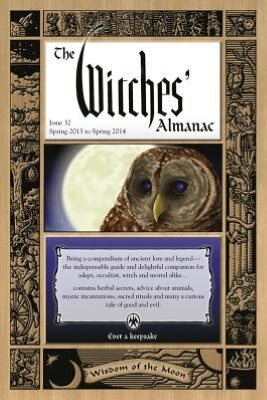 For more than forty years the almanac has provided the witch community with a lovely collection of lore, and this year is no exception. Witches see things differently, says the preface, going on to talk about how we have relationships with many, and not just the living, or physical. "We are gifted with knowledge that others do not have, but with this insight comes a responsibility to our friends and to the world around us." Containing history (the delightful "Diana and the Giants", "Cats in Islam"), lifestyle tips (the entertaining "The Proper Topper" (a discussion of top hats from stage magic to steam punk), "Pistachio"), astrology (the appropriate "Lunar Nodes"), stories ("Chang’e and Jade Rabbit") and plenty of God/dess lore ("Athena and Arachne", "Apollo and Hermes") this is a wonderful compendium of practical knowledge. I especially liked the articles on mirrors, and lunar teas, but everything was a fun read. This is a great book to last the year!